Lightolier Coffaire Collection Static recessed LED luminaire in white baked polyester enamel finish, has cold rolled steel construction for added strength and durability. This luminaire incorporates an integrated thermal management system that conducts heat away from LEDs and transfers it to the surrounding environment. The intelligent driver technology is a factory calibrated system for providing the customer multiple lumen outputs to balance energy savings with lighting application needs. 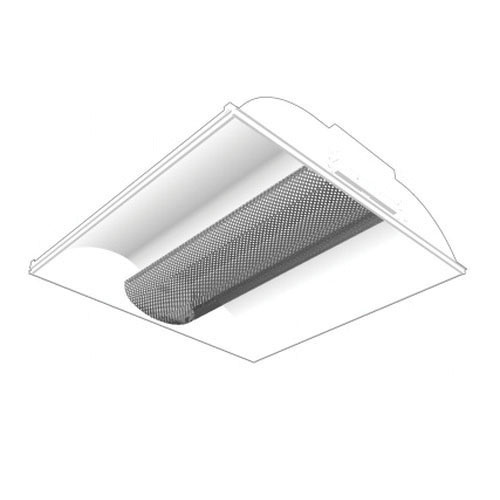 The luminaire is compatible with flush to face of slot T-grid and slot G-grid ceilings. It features a perforated mesh shield with dust shield shade that can accommodate 31.3-Watt LED lamp. This 83.8+ CRI luminaire delivers a light output of 2100 Lumens. It has a color temperature of 4000K with an average life of 50000 Hours. The luminaire measuring 24-Inch x 24-Inch x 5-Inch, has a voltage rating from 120 to 277-Volts AC and an efficacy of 65.7 LPW. The recessed LED luminaire meets cULus and RoHS standards.